Listen, promote and quickly reply to move your brand to the top on Twitter. By Q3 of 2016, 317 million people were using Twitter across the world every month. This marks the network’s highest count of monthly active users to date, and it’s a number that is set to continue growing in 2017. This high volume of users makes Twitter a valuable resource for marketers. Naturally, a large pool of users signals an extensive reach to tap into, but the value of Twitter for your business also lies in the data insights it can yield about your target audience. All those 2016 buzzwords about ‘customer obsession’ and the ‘age of the customer’ are here to stay, and will be more relevant than ever this year. Any marketing strategy worth its salt should be investing time and resources into understanding the customer journey, and how prospects are moving through it – Twitter is a great place to start. So how can you use Twitter as an information resource about your target audience? And how should you act on this insight once you have it? Keep reading. #1 Listen – and respond if appropriate. Use a listening tool to track brand mentions and conversations around relevant keywords. For example, if you’re a brand selling organic cough drops, you might want to set up a listen report to keep tabs on conversations around the ingredients you use, or relevant keywords like ‘sore throat’. This data can be useful in a few ways. Firstly, you can use these reports to identify trends in the conversations you’re monitoring. When people tweet about having a sore throat, what else are they mentioning? This is a useful direction for your content creation, because you’ll get an understanding of what your audience cares about and how to serve those needs with the right content. Secondly, you can get an understanding of market differentiation. Are different markets mentioning relevant keywords at different times of the year? Listening data can help you map these seasonal cycles. Thirdly, you can start gathering insights about your competitors. Is your potential audience mentioning the competition when tweeting about having a sore throat? Why? Answering these questions with listening data can help you build a picture of where your brand is positioned in the market. And finally, listening can help you uncover opportunities to interact and engage with new potential customers – when appropriate. Going in and replying to every comment about a sore throat is dangerous, it will make your brand look spammy and ultimately create negative sentiment. If however, a comment is specific enough to warrant a reply, then it’s a great idea to go in and engage. For example, ‘I have a soar throat and I need something to fix it. Help!’, would be the perfect time to reply. Once you’ve built an accurate understanding of your Twitter audience and what they care about, you can use these insights to create content for promoted tweets. 57% of people who discover new products through online ads are likely to explore it further. Using promoted tweets can be a valuable (and inexpensive) way to get your brand message in front of the right audience and spark some direct engagement with branded content. This will help facilitate a cold audience into the next key stage of the customer journey: moving into your brand’s ecosystem. Here, your prospects are no longer out in the public sphere, they’re moving into your brand’s owned channels. Your promoted content absolutely cannot be spammy. The goal with promoted tweets is to provide value, establish trust, and build credibility for your brand name – do not try to trick people into clicking a link. It’s also crucial to keep promoted content fresh on Twitter – try not to let a campaign run for too long. If you want to stay on the same line of messaging, find a different way to say it. #3 Keep your response time down. Twitter is the leading social network for customer service, and it’s public, which means a conversation can be distributed. Not only can your one-to-one interaction with a follower be witnessed by others in real-time, it can be shared for others to see afterwards. And if your social customer service strategy is on point, this public interaction can be a valuable resource. Statistics show that the faster you respond to a query on Twitter, the more likely it is that a customer will do business with you again, so it’s crucial to get in there fast. A community management tool like Falcon’s Engage can help you prioritize incoming comments by identifying negative sentiment, as well as gaining a quick overview of your historical interactions with an individual before you respond. Using historical content in your responses will ensure your interactions are personalized, sensitive and genuine. Even if a customer has come to you with a problem, they can be nurtured into a strong brand advocate if they have a positive and timely interaction with your brand. Twitter is full of possibilities for discovering new audiences and becoming closer to your existing customers – when you approach it intelligently. If you’d like to explore more of what Twitter can bring to your marketing strategy, why not take a look at our Essential Guide to Twitter Marketing? 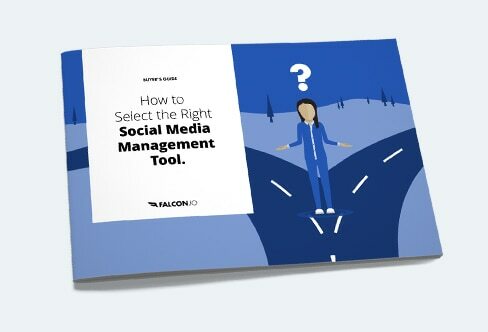 Part 2 of the Social Media Networks Guide showcases the ways marketers can use Twitter for business.